Spring must be in the air as the temperatures have been upped a notch while a variety of weird and wonderful flowers have come out to play with the promise of brightening up your day! Relaxing sounds of nature, including those of birds whistling amongst the trees, greet you as the sun beams down in this free Flowers slot machine which sees you go for a stroll through a beautiful garden that has been perfectly maintained. Whether you’re a green fingered gambler or not, you’re bound to love this colourful is powered with software by Net Entertainment (NetEnt) and has proved to be one of their most popular real money online slots since being released. The 5 reels in this online slot are awash with vibrant colours and there are 30 fixed win lines which have been labelled with small tin plant pots. To access the garden, you’ll have to stump up a minimum of 30p while the max bet allowed is £75 and it’s well worth doing so as you’ll see an array of striking flowers like Venus Flytraps and Roses - some of whom are happy while others are angry and evil! The Flowers video slot boasts that you can win up to 75,000 coins and it’s clear to see how once you look at the pay table. The pay table has been designed in the style of a hanging wooden plaque and it showcases the Wild Sun, Scattered Clouds and variety of flowers that you’ll be seeing fall onto reels. What will really capture your attention are the inclusion of Double Symbols meaning you could land ten-of-a-kind winning combinations plus there is a fantastic free spins feature to experience too! It’s the beaming sun that dominates these reels as it’s the Wild symbol, possessing the power to substitute for all but the clouds (the free spins symbol) and the double symbols. On top of its substituting abilities, the Wild symbol will see you rewarded with 250, 1,000 and 5,000 coins for landing three, four or five on the same line respectively. Of the flower symbols, it’s the Roses that are best of the bunch as, despite their grumpy appearance, they offer generous rewards of up to 2,000 coins. Sunflowers are the next most lucrative in this garden as they are worth up to 1,800 coins, evil looking Venus Flytraps will see you claim up to 1,600 coins, cute little Tulips are worth up to 1,400 coins, Bluebells see you scoop up to 1,200 coins, plus there are also Ace to Jack playing card symbols which are worth the least of all. You’ll find yourself on cloud nine brimming from ear to ear with a smile as wide as the clouds whenever you land four or more of their symbols at once as this feat sees you trigger a very rewarding bonus game. During your free spins, there will also be a bet multiplier active which is applied whenever you land three or more cloud symbols, however its value and the number of initial spins you receive will be dependent on the number of clouds that initially triggered the feature. Four cloud symbols see you receive 10 free spins with a 2x bet multiplier, five clouds earn you 15 free spins with a 2x multiplier, six clouds and it’s 20 free spins you receive with a 2x bet multiplier applied again, seven see things ramp up with you receiving 25 free spins and a 4x bet multiplier, while eight cloud symbols see you earn the maximum of 30 free spins which come with a colossal bet multiplier of 10x! Flowers is one of the most vibrant and relaxing slots that I have ever come across. 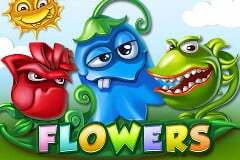 The combination of quirky cartoon graphics, natural sound effects and an extremely lucrative free spins feature ensure that you’ll be having a blooming good time spinning these reels and it’s a slot which has proven to be so popular at online casinos that NetEnt decided to release a sequel which has been titled Flowers Christmas Edition so ensure you check our review of it too.